Chemistry is relevant to global warming and climate change in three important ways. Climate change is governed by chemical phenomena; the underlying chemistry of global warming centers on the phenomena commonly described as the greenhouse effect. In short, this term refers to the theory that the temperature at the surface of the Earth is maintained higher than would be calculated from a simple radiative budget due to the adsorption of longer-wave radiation in the atmosphere. in the baseline (non-polluted) air at the top of Mauna Loa, Hawaii. The basis of all techniques used to measure CO2 is infrared (IR) spectroscopy. a = (4- n • k) / A, and c is the concentration of the compound, l is equal to the path length of light through the sample, I is the intensity of radiation having passed through the sample, I0 is the intensity of radiation in the reference beam, k is a constant for a given substance called the extinction coefficient, and A is the wavelength. Ultraviolet spectroscopy works on the same principle as IR spectroscopy, but with UV light, which excites electronic, not vibrational energy levels. UV spectroscopy is useful for quantification of compounds that do not have an IR signal, such as ozone. Many of the elements utilized by life have more than one stable isotope. Because isotopes decay at a fixed rate and some physical, chemical, or biological processes favor one isotope over the other, this often offers the ability to use these isotopes to give pale-ontological information. Two of the most important techniques from a climate change perspective are 14C dating and 18O temperature records. The ratio of 12CO2 to 14CO2 in the air is maintained at a constant ratio, with 14CO2 making up less than one part per million of the total. However, when the carbon from the CO2 is trapped away from the atmosphere, either physically in ice or chemically in biology, the 14C decays at a fixed rate (the half-life at around 6,000 years). Thus, for any sample of carbon that has been locked away from the atmosphere, the time it has been locked away can be calculated based on the amount of remaining 14C. The ratio of 18O to 16O in the atmosphere varies as a function of temperature. When the O2 is fixed into ice or biological systems, the ratio is determined only by the decay of 18O. Thus, if the time since the oxygen was fixed is known, then the temperature at the time the oxygen was fixed can be calculated. When air is trapped in ice cores, these two techniques can be combined to determine how long ago the air was trapped, and what the local temperature was when the air was trapped. When the amount of CO2 in the air is quantified by IR and the dust in the air is collected a record of temperature, CO2, and dust going back hundreds of thousands of years can be constructed. This record has been central to the global warming debate. When faced with the task of measuring atmospheric components such as chlorofluorocarbons (CFCs), which have very low atmospheric mixing ratios, one approach is to first attempt to separate the air into its constituent components. Russian scientist Mikhail Tswett invented this technique in the early 20th century. Tswett ground up plant leaves in petroleum ether, and passed the resulting liquid though a glass tube filled with powdered chalk. Tswett observed that as the liquid passed down the tube, a range of colored bands were formed; thus demonstrating that leaves contain a range of different pigments. More important, however, he had invented a new separation technique, this technique he named chromatography (meaning literally "color writing"). In a general chromatography experiment, analytes in a mobile phase are passed though a stationary phase and are separated depending on their affinity for the stationary phase. A century after its discovery, there are now a great number of different chromatographic techniques allowing the separation of a wide variety of analytes. The technique of most relevance is gas chro-matography, which separates a mixture of gases by passing them through a long column. The column is packed or lined with material that traps different components with a greater or lesser affinity; this ensures that each component arrives to the end of the column at a different time. Once separated, the analytes are detected by a number of techniques. The most popular one for CFCs is called Energy Citations Database (ECD), which measures the dip in current across a small gap that occurs when the CFC molecules pass. 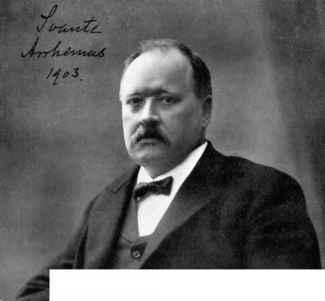 Svante Arrhenius, considered the father of climate change science, was also a founder of the field of physical chemistry.